Elemental Level seeks to help listeners return to a simpler human times where culture and community were central to daily life. Too often, our primitive lives are covered by modern conveniences and hectic lives. Join us as we journey back to our roots, discovering the peaceful tranquility of community and the excitement of drum circle performance. We are proud to announce the release of Elemental Level’s first album, Drum On…, which is available for purchase and download at the band’s website located here. 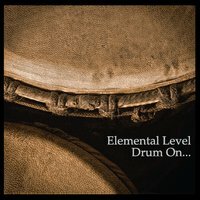 Drum On… is the first release from the Elemental Level Drum Circle. Drum On… represents our desire to capture the relaxing and meditative qualities of African djembe drumming. Listeners enjoy Drum On… for its ability to create relaxing and meditative moments in our busy lives. Health care providers enjoy playing Drum On… as background music during their treatment sessions. Drum On… is currently played in chiropractic offices, acupuncture offices, and yoga studios in Chicago and Baltimore. Our music is great music for your store, ceremony, celebration, or quiet times.Elemental Level is available for bookings to support your special function, home school event, party, festival, yoga class, pilates class, or community event. Please click here to e-mail your booking request.